Hello, my name is Jozi and I am an obsessive cardmaker. Not a day goes by that I don't spend a bit of time in my craft studio at home. I often start or end my day there. When you love making something, you likely soon accumulate quite a quantity of it and the same is true for my cards. Solution? Sell the cards online, and so it begins. 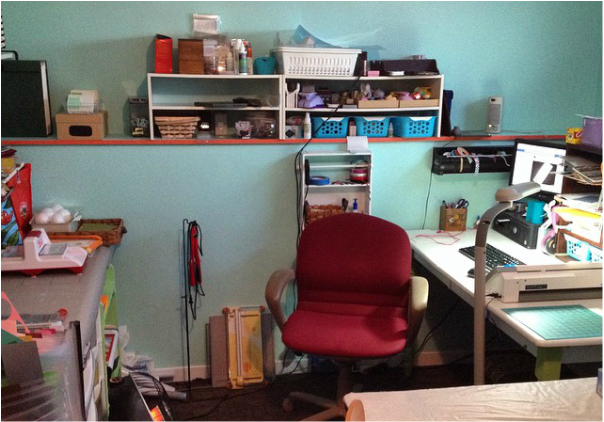 My craft studio is fairly basic, with utilitarian shelves and tables. I have many boxes, and bins full of pretty papers, ribbons, buttons, paper crafting tools and more. When I start to make a card, I first start by deciding if the card will be specifically for a child or adult, boy or girl, woman or man. Often at this point I will also have determined that I want to use papers from a specific collection in my stock. Once I have a layout in mind that I like, I get to work crafting my card. I first decide on all the colours I will be using in the card and will pull out the base that I will be using, typically cutting it down to the size of a standard note card. I then cut layers of decorative paper and card stock matting, either with a paper trimmer, paper punches, die cutter, or my electronic paper cutter, depending on the complexity of the shapes I need. Once all my pieces are measured and cut, I apply adhesive and assemble all the elements, taking care to properly center and align everything just so. To embellish my cards, I may use any number of things, such as die cut shapes, buttons, ribbons, string, rhinestones, sequins, and more. When it comes to birthday cards, I can't get enough of adding bling and sparkle to them. Sequins and rhinestones make any card extra-fun! The birthday greeting on the card front is either stamped, printed, or cut from card stock, and often popped up to give the card an extra burst of personality and depth. If somebody needs the recipient's name or age added to the front of the card, I am happy to add it at no extra cost and with very little time added to my shipping window. I think personalized cards are extra special because it lets the birthday person know that this card was made *just* for them. They usually end up keeping their cards for many years after too. Part of my satisfaction in making a birthday card for somebody, is hearing back about how thrilled the person was to receive it, because real people love real cards. in my home, in Saint John, New Brunswick, Canada. ﻿I have made hundreds (thousands perhaps) of cards over the years and the one thing I hear all the time is that the recipients treasure their cards, especially the personalized ones. They love them and hold on to them for many years.